Typical garden snails aren't inherently poisonous, and are usually safe to handle and eventually eat if your tastes lean toward escargot. The marine cone snail, however, has one of the most powerful poisons in nature. It's designed to paralyze fish almost instantly. Although it doesn't often kill people, it can if you are stung near your heart or have a weak immune system. Cone snails are marine animals that can grow up to 6 inches long. Their colorful shells offer protection from predators as well as a warning; if you see a brightly colored cone shell, it's best to leave it be. Cone snails carry a vicious poison designed to render its prey immobile almost immediately. The poison differs between cone snail species, but some contain a mixture of nearly 100 toxins. Cone snails have four appendages that protrude out from the front of the shell, including a proboscis. This appendage hides a deadly barbed harpoon that shoots out and snags prey. It keeps the fish tethered to the snail until the fish is paralyzed, which often takes only one or two seconds. The toxin by itself isn't designed to kill the prey, although it's certainly lethal enough to. The main goal is to make it immobile enough for the snail to swallow the fish whole. When a person picks up a cone snail, the snail might strike out of self-defense. Depending on where the person is stung, there could be localized swelling, numbness, pain, nausea, paralysis or difficulty breathing. In rare cases, it can lead to death. There's no antivenin for the toxin, so doctors typically treat the symptoms until the patient's body fights off the poison. The cone snail's poisonous cocktail contains neurotoxins that are being studied for effectiveness in human diseases. "Scientific American" reports that scientists are isolating the toxins and testing them for uses such as fighting pain and seizures, as well as working as muscle relaxers and healing aids after strokes and heart attacks. 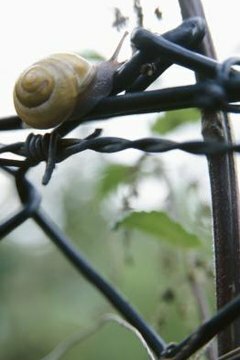 Typical garden snails pose a much smaller risk for you than cone snails, which is a good thing considering you're much more likely to encounter a garden snail. Touching the snail or even letting one crawl on you holds no danger, as snails aren't poisonous. If you like to eat them as escargot, however, you can't just pick up a garden snail and cook it. Snails ingest dangerous chemicals, such as pesticides and snail bait, as they move through flower beds looking for food. If you eat a snail while he still has these chemicals in his system, you're also eating those chemicals, which can be poisonous. Placing snails in a mesh-covered bin with cornmeal in the bottom allows them to eat healthy while flushing out the chemicals. After at least three days the snails should be safe to eat.